After several days of wanting to throw my camera and my home phone through a window, I have finally gotten at least the camera to cooperate. Unfortunately, my phone still breaks ever time someone calls it. Kind of defeats the purpose of having the phone, but our service provider doesn’t seem to understand that. AAAHHH how frustrating. On to better things. After having a memory card error for almost a week, I was finally able to retrieve my pictures off my camera. 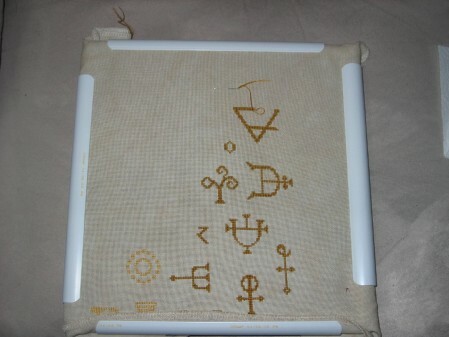 While we were visiting Allen’s grandparents two weekends ago, I was able to do a bunch of stitching on Alchemical Romance. I am now almost to the halfway point on that piece. I love stitching on it as it feels like a bunch of tiny little finishes. I have also been working on Deb’s RR. 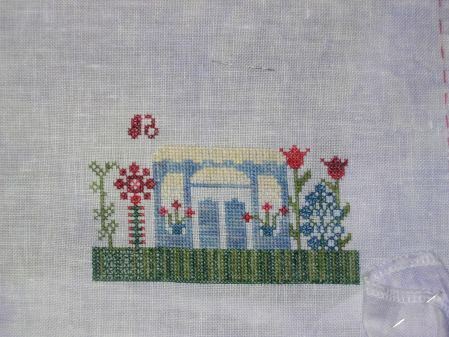 She really picked some pretty houses for us to stitch. This is one of the Morbid Pithies which you can find at theworkbasket.net. Deb also provided us with really pretty fabric to stitch on. I wish pictures did better justice to all the beautiful fabbies I have seen over the years. Well, I should be off to try and get a bit of stitching in before bed…and maybe some ice cream too:) Bad Leslie! !